RUSH: Let’s go to the phones. West of Boston, Donald, you’re up, and I’m glad you held on. I appreciate your patience. Hello, sir. CALLER: Hello, Rush. Help me with this Fairness Doctrine. Let me give you my assumptions, and you can tell me if they’re wrong. RUSH: I’ll be happy to, sir. I’m an expert on the Fairness Doctrine. I’m an expert on fairness. CALLER: Okay. First, I’m thinking that the radio spectrum is a finite resource. And then I’m thinking that the government has claimed ownership of that, with the FCC and with other international treaties. So the government thinks that they can control this with licenses, spectrum frequencies and all that. So why can’t they allocate speech as well? RUSH: Ever heard of the First Amendment? RUSH: The people own it. That’s the point. They’re considered public airwaves. The people own it. Not the government. You have got to get it through your head and a lot of you do, too, that the government is not the people and that the Bill of Rights was written to limit what government can do in terms of restricting the freedom of the people. The Bill of Rights is not what government grants us. It limits them. I will continue on this when we come back. One of the things I want to remind you all of on this Fairness Doctrine debate, question, threat, whatever it is, do you remember the Pew poll? We’ve got this poll up. Koko, grab this poll and put it up on the website either now or when we update later this afternoon to reflect the contents of this program. Because remember, for a while I was saying, ‘You all are the most knowledgeable audience in all of American media.’ The Pew Research Center for People and the Press went out, and they interviewed people, and they asked them a series of questions, three news knowledge questions, and the most informed audience belongs to the political magazines and my radio show. This radio show has the most informed audience of all broadcast entities out there. After that came news magazines, online news sources, NPR, the Daily Show, and the O’Reilly Factor, the television show. But in a list of broadcast media outlets, this program has the most informed audience. Now, you have to understand, the guy called and said, ‘Isn’t it fair for the government to regulate speech, if they regulate everything else about the federal broadcast spectrum?’ No. We operate in the marketplace. Radio stations are businesses. Television stations are businesses, and television, over-the-air-television — I don’t care whether you get it on cable or not, but broadcast signals, your big network stations (this does not include cable news channels, but your local ABC, NBC, CBS, Fox, CW affiliate, whatever the affiliates are), they’re all over-the-air whether you get it on cable or not — and they, too, are regulated. They are part of the spectrum, so why shouldn’t the Fairness Doctrine apply to them? For example, this is a syndicated program. I am not on a particular radio station. I’m not an employee of a radio station. So what would happen? The way the way the Fairness Doctrine would work — and it’s being set up this way — is professional complainers hear me — take any element of today’s show — criticizing Harry Reid, Ted Kennedy. Within minutes the general managers of 600 radio stations would receive phone calls from MoveOn.org-type activists demanding that they get a chance to respond to what I said, and they might put ’em off for a while, but they’d keep calling and keep calling, and if the Fairness Doctrine were law, they would have to grant that, and then the station managers would say, ‘To hell with this! We can’t run a business this way. This is ridiculous. We’re turning over the programming, literally, to people who aren’t broadcasters. We’re a business,’ and so they just cancel all the, quote, unquote, controversial programming and they’d have to go back to, you know, doing things that nobody wanted to listen to, which is what happened when radio was regulated so much in the first place. Let me remind you, you may not remember this, but I’ve been in radio since I was 16, and back when I started in 1967, there were a number of controls, and there was all sorts of regulation. Every five years — this is still the case — everybody that owns a radio station has to get their broadcast license renewed by the FCC, because they’re using the public airwaves. The public is not the government. Please don’t ever make that mistake. I don’t want to ever hear anybody call here again and say that the government is the people. The elected officials are representatives of the people. But the broadcast airwaves are owned by you, theoretically. It’s ours because it’s air, and we’re putting stuff in the air, signals, that your radio can receive, and so forth and so on. So because of that, management’s at radio stations, both groups and individual stations lived in fear that their license was not renewed every five years. So, they had to go out and make sure they didn’t get in trouble. When the Fairness Doctrine existed, there wasn’t any controversial programming at all. It might have existed in pockets around the country, but if it did it was from midnight to six or nine to midnight, this time when radio listenership is losing to television viewership, especially in the early days of TV when everybody was going out and buying TVs. Color TV came in, so they didn’t care what happened at night on radio because nobody was listening them. Well, part of this license renewal every five years was something called ‘public ascertainment,’ and I had to do this a couple times when I was a program director at radio stations, and what it was was, we’d have to convene meetings of community leaders. We did it in the public libraries, wherever, and we would ascertain what they thought the radio station should be providing the community. So if it ended up after ascertainment — and we had to make detailed reports on all this. In fact, I got yelled at by a general manager once for arguing with some of these people during ascertainment. I remember in Kansas City once we had a meeting in a library, and this guy was — this is a music station, by the way. We were just playing music! This guy got into, ‘Well I want to hear more about public libraries. I want to hear more…’ You wouldn’t believe the kind of garbage that nobody would care about listening to, that these people wanted on the radio. So at the end of ascertainment, let’s say that 2% of the people that we interviewed wanted agriculture news. Okay, well, we had to do it. Two percent of the programming had to be agriculture news. We had a number of ways to do this. You could do the morning barnyard report at five a.m. before everybody got up, and you could do ten or 15 minutes of it and do enough of it every day so that added up after seven days to 2% of the broadcast week. Even in Pittsburgh when I moved there in 1971, this stuff was still going on — and because Pittsburgh is in an ADI that includes a lot of agriculture communities, we had to do a certain amount of farm news. Well, I’m doing a morning show playing music and the last thing that the audience of my show cares about is farm news. If farm news came on, bam! They pushed the button and go somewhere else. So we had to figure out, ‘Okay, how do we do this and protect the license?’ So I turned the farm news every day into a funny bit with farm sound effects and the roosters crowing and so forth, and I’d make fun of the stockyard feed prices or whatever it was, so that we could say, ‘We’re doing barn news,’ agriculture news. There was all kinds of things like that. You remember, going back 20 years on radio, you’d get up on a Sunday morning, turn on the radio you’re listening to some of the dullest, public service programming? You’d have two people coming in and talking about carrot cake recipes for the holiday season. It was just absurd, and all this stuff was dumped either from midnight to six or it was put on early Sunday morning when people were not listening to the radio. I can remember having to run religious programming. In my little town of Cape Girardeau, there was a large religious component that wanted to hear a lot of religious programming so we’d go out and we’d sell hour-long programs to local preachers, and some of them were a hoot, you know? Some of this stuff was unbelievable. All that’s gone by the wayside now. You can turn on the radio on Sunday morning and listen to stuff you want to listen to, and you don’t have to listen to barnyard news when you don’t care about it. Nothing against ag news here, but all that stuff went by the wayside because radio was losing listeners. It was losing business. Television was coming in, and television wasn’t governed this way. Television, if they put barnyard news on, it was part of a normal, hour-long newscast and so forth that local TV stations did. But if this Fairness Doctrine ever comes back, that’s the kind of stuff that’s going to end up being back on radio, and it will die. AM radio will die if it has to start ascertaining the community and all these non-broadcasters and nonprofessionals and professional muckrakers who want radio to die — and believe me, the whole left wing of this country does. They’ll make sure that local AM radio is filled with the most worthless garbage, including their views, which has also been shown on radio to be unattractive. Nobody wants to listen to it. But if this Fairness Doctrine comes back, I’m a syndicated program. I’m not an employee of any radio station. Yet local activists could go to your local station carrying this show, your local EIB affiliate and demand equal time for what I am saying. Well, okay, fine. Well, then why can’t we pepper television stations under the Fairness Doctrine? I want equal time to what I just heard on the ABC World News Tonight. You tell me that that’s balanced? You tell me that the CBS Evening News with Katie Couric is balanced? You tell me that the NBC Nightly News with anybody, Brian Williams is balanced? Give me a major break! How about these morning shows that are full of pap? You know, we could flood television stations, but note that the Fairness Doctrine is not being applied to television. Nobody is talking about reapplying it to television. They only want to reapply it to radio, and it’s not because they want ‘all sides represented.’ When I started, 1988, the number of talk stations, radio stations doing talk from sunup to sundown, well, 24/7, was 125. There were one hundred and twenty-five talk stations in 1988. There are 2,000 today. There are 2,000 radio stations doing talk, and there are leftists out there hosting shows. Some of them are local. Some of them are fledgling out there, so-called ‘national,’ with 40 or 50 stations. (Yip yip yip yip yahoo.) You’re not national, in advertising terms because this is where it matters, until you reach over 90%, until you have the ability to reach 90% of the population of the country. Do you know how you do that? You get yourself on the best stations you can in the top 25 markets. You get yourself on the best stations in the top 25 markets and you reach 90% of the American population. RUSH: Look, folks, as I have said, the left is simply afraid of debate in the arena of ideas. When they had their monopoly throughout the broadcast and print media, they didn’t have to debate opponents because there weren’t any that mattered — and they won’t debate now. They’re just trying to shut down. Their attitude is, ‘There is no opposition. There’s no legitimate option, and we’re not going to go out and debate these people in the free market,’ even though they tried, but they weren’t actually debating. They were just (sigh) making a mockery of it. They weren’t even broadcasting. They weren’t even radio people. They didn’t even know what they were doing! They just thought that they would imitate what they think we do to get success here, which proves that they don’t understand it. Look at this analogy, if you will. We’re still bouncing off the guy who called and talked about the spectrum, the radio spectrum, all the frequencies that are out there. The radio spectrum is kind of like the Highway System. It facilitates commerce, but there are only so many interstate highways available, and there are only so many radio frequencies available, on the AM band and the FM band, the police band, the CB band, all of that. So on the Interstate Highway System do we require that the number of supply trucks of a certain company be no more numerous on the highways than those of another company? No. We let the market decide. You know, if Yellow Freight happens to be the biggest freight company out there — I don’t know that they are; they just popped into my head here — and there are more Yellow Freight trucks anybody else, well, will you say, ‘There are too many Yellow Freight trucks. We need Consolidated Freightways to get their fair share of the interstate highway.’ No, but that’s what they’re trying to do with the Fairness Doctrine. The Highway System, we pay for that, too, and it’s public. It’s the same thing. The free market. Who is next? RUSH: Joe in Mount Pleasant, South Carolina, I’m glad you waited, sir. Appreciate it. Welcome to the program. CALLER: Hey, I’m not too sure that wasn’t Harry Reid calling you. Are you sure he wasn’t calling from Boston? CALLER: Hey, to my point, the reason why I called, I’m kind of in a bind. I am from South Carolina, and Senator Graham is one of our senators, unfortunately. I know you’re well-traveled. RUSH: I think he owes you guys an apology, by the way. RUSH: Some of his rhetoric today on the Senate floor. CALLER: I agree. I’d accept his resignation instead, though. (chuckles) Yeah, basically I was wondering, you’re well traveled, you’re well respected, and you’re well connected, and I was wondering if you had anybody that you knew of who falls under your tutelage or your mentorship here in South Carolina or outside that could move into South Carolina, to run as a Republican opponent of Senator Graham? RUSH: — Arkansas to Washington to New York and become a senator there? RUSH: You know, I’m not in the political recruitment game. You know whose job that really is? RUSH: Is John Ensign’s. He runs the Senate campaign committee. RUSH: And it rotates every, I don’t know, election year. Elizabeth Dole did it last time, and Ensign is — by the way, he changed his vote. He was against cloture this time around. But he’s not going to sit there and make a move against a sitting Republican senator. His job will be to help Lindsey Graham get reelected. I think that’s, frankly, the people of South Carolina’s job to take care of. Look it, in politics there’s a market, too, and there’s probably somebody in South Carolina saying, ‘The next time Graham faces the voters,’ and he will next year, ‘I’m going to run against him in a primary, because I think I can win because I think Lindsey Graham has angered enough South Carolinians that I think we can pull this off.’ The political market will produce that person. 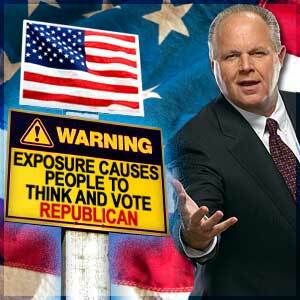 RUSH: You know, I don’t identify candidates. I just try to correct them once they get elected, maybe now and then. That’s a job of political professionals and I’m a media professional. CALLER: Okay. Like I say, I just think a bigger problem than this immigration bill is when he ignores, you know, over 60% of his constituents and decides to vote this way. RUSH: Well, it’s a problem for him. He’s gotta face the voters next time up, and this is the price he’s going to pay for the positions that he took. He’s gotta go face the voters. He’s gotta explain why he did what he did and face their wrath. It’s the way the system is designed to work. RUSH: All right, Paul in Lake in the Hill in southern Illinois, nice to have you with the EIB Network. CALLER: How are you, Rush? RUSH: How are you? I’m good. Thank you very much. CALLER: Okay, great. I really appreciate it. It’s an honor to speak with you. I had an observation on the Fairness Doctrine and the way talk radio works, especially your show and most others. Do you not provide a large number of sound bites and direct quotes and as a result are you not giving airtime to the opinions and the opposition side already? CALLER: We should be pointing this out. RUSH: That’s an absolutely good point, an excellent point. I, in order make my arguments, always present the arguments of the left and then I refute them. We play Dingy Harry and Ted Kennedy all over the place here today. CALLER: Yeah. In addition to that, on many talk shows, they’ll take guests. A lot of opposition refuses to even go on to those shows. So they are given the opportunity to have a fair and balanced show, but they don’t even take that opportunity! RUSH: Exactly right. It’s like the Breck Girl will not show up on Fox News Channel, but he’ll send his wife out there to complain to Ann Coulter when she’s on MSNBC. It’s an excellent point. The left’s point of view is not denied here. It’s just not advocated. The left’s point of view isn’t advocated here, but their point of view is. My gosh, I tell you more about them than they will tell you about themselves. I tell you more about what they really believe than they will tell you. I tell you more about what their intentions are than they ever will. You know, they’re the ones running around with masks and camouflage and so forth. I don’t lie about the context in which the statements of theirs that I air occurred. I don’t lie about the context. I don’t try to fool people about what we’re saying here. You know me. We want a fully informed populace; as many informed, educated, engaged people as possible in the arena of ideas, going out there and voting. We want legitimate, substantive, real change. We don’t want it to come about through propaganda, lies, or any of these other things that the left requires to achieve its power.